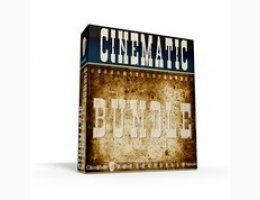 The Cinematic Bundle from Chocolate Audio is a collection of their best cinematic oriented products. It includes the Model 7 Grand Piano, Model 80 Electric Grand Piano, Model D Grand Piano, O.D.D. Grand Piano, Steinbach Upright Piano, Uproar RAW 8-string guitar, Uproar Vol. 1 - loops and Uproar Vol. 2 - loops.